On Sunday, we lost 6 men to a horrifying attack on a mosque in Ste. Foy. Their names were Mamadou Tanou Barry, Abdelkrim Hassane, Khaled Belkacemi, Aboubaker Thabti, Azzeddine Soufiane and Ibrahima Barry. The news of this mass murder, the stories of who these men were and who they are leaving behind, has filled those of us here at COCo with grief. It was important to us that this be the first thing we say today. Our hearts are heavy knowing how much harder this falls on Muslim communities. How much heavier this is for those around us who have been and are directly targeted by Islamophobic violence. 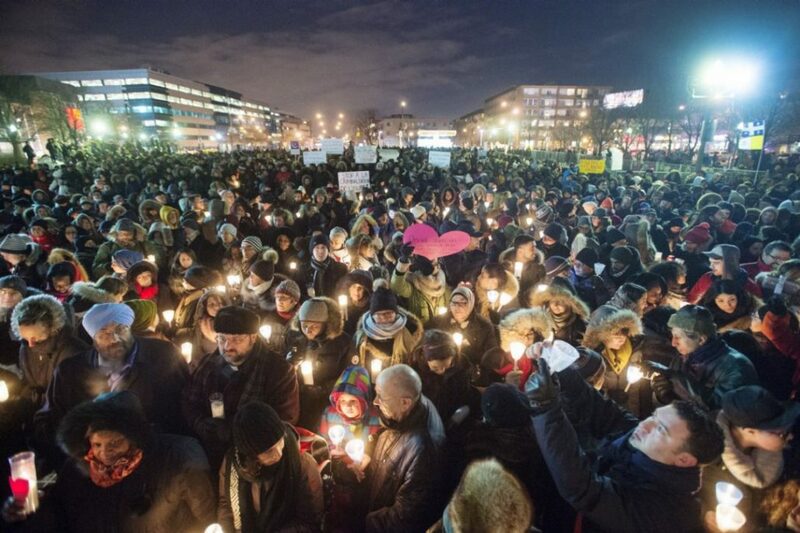 While many across the province are in mourning, one of the responses to this week’s horrifying events has been to assert that Quebec is an inclusive, diverse, place, and that the massacre does not reflect the values of the province. While we wish this assertion reflected reality, the killings—alongside a stark increase in hate crimes in the days after the shooting—paint a troubling picture. Indeed, something has been deeply wrong for a long time: in recent memory, the reasonable accommodation debates, the Charte des Valeurs, the ban on the niqab and hijab in 2010, the virulent xenophobic discourse on Quebec’s radio, and increased right-wing fascist activity in Montreal & Quebec all point to a sustained and ingrained problem that crosses government, media, institutions, and community. While it can be tempting to distance ourselves from this brutal attack and pin it on a “bad seed”, the reality of systemic oppression requires us not only to decry that injustice, but also to look deeply inside of ourselves, into our relationships, our movements, and our communities, and uproot that injustice where it is living. Where do Islamophobia and xenophobia live in the community sector? What do we do when “progressive” organizations support and put forward policies and opinions that attack Muslim women for their religious beliefs, for example? How must we act differently when anti-immigrant rhetoric is used by service providers? Where do Islamophobia and xenophobia live in ourselves, and in our communities? At the same time, as is so often the case, many organizations are also stepping up in this time of pain. Two immediate sources of support come to mind: Girls Action Foundation is providing a healing space for Muslims on Friday, and Head & Hands has offered the services of their counsellor and social service team. We would like to close with words from Farha Najah, who spoke at the vigil on Monday night. I want to say that this injustice stops here and now, that systems based on oppression, power, and privilege leading to the tragedy we are trying to grapple with today must end now. It must. I also know that so many of us have been saying this for far too long… And so, I invite us to take a moment to reflect on our humanity, and to keep holding each other in all of our complexity, lived realities and identities, to keep holding each other as community, to keep holding each other in space, in words, in art, in conversation, in breath with deep love, care, and compassion. To keep holding, to keep holding, to keep holding. Please let us remember to keep taking care of ourselves as we take care of each other during this trauma. To my family, friends, and communities who are living in fear and sadness, let us breathe in resilience, let us breathe out resilience. We will make it through, even if through the haze of our tears, in solidarity in our fight for social justice and liberation.